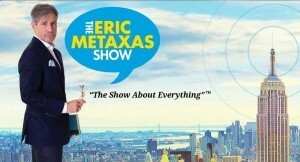 Eric Metaxas is the author of the New York Times #1 Bestseller, Bonhoeffer: Pastor, Martyr, Prophet, Spy. Named “Book of the Year” by the ECPA, Bonhoeffer also won the 2011 John C. Pollock Award for Biography awarded by Beeson Divinity School and a 2011 Christopher Award in the Non-fiction category. Called a “biography of uncommon power,” Bonhoeffer appeared on numerous 2010 “Best of the Year” lists and was featured in the Wall Street Journal, Publishers Weekly, The New Republic, Harper’s, Kirkus (starred review), NPR, FoxNews, C-SPAN’s Book TV, Christianity Today, The Weekly Standard, and First Things. Bonhoeffer has sold more than 700,000 copies and has been translated into 17 languages. It was recently ranked #21 on the Amazon.com listing of Most Highlighted Books of all time. Metaxas was the keynote speaker at the 2012 National Prayer Breakfast in Washington DC, an event attended by the President and First Lady, the Vice President, members of Congress, and other U.S. and world leaders. Previous keynote speakers have included Mother Theresa, Bono, and Tony Blair. That speech and Eric’s essay on the experience, were put into a book, No Pressure, Mr. President: The Power of True Belief in a Time of Crisis.